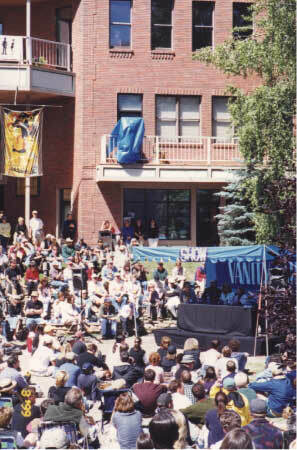 Christopher Wehner, web editor of the Screenwriters Utopia and Creative Screenwriting, reports from the Telluride Film Festival today, Saturday September 4th, 1999. So there I was, armed and dangerous. My backpacked was stuffed with everything I would need. First and foremost, "The Ultimate Film Festival Survival Guide," by Chris Gore Editor-in-Chief of FILM THREAT magazine. If you haven't read it, and regularly attend any festival, you're missing out. Second, my weathered and worn "VideoHound's Independent Film Guide." I had other things like a camera, film, water bottle, cell phone, but these paled in comparison to my reading material. Standing in long lines while waiting to see a film requires good reading material. I also had current copies of my favorite screenwriting magazines, CREATIVE SCREENWRITING and SCR(I)PT. Word about some of the movies featured at Telluride, which does not announce its lineup until the opening of the festival, broke out earlier in the week. The main opening night film was Disney's "The Straight Story," directed by David Lynch and starring Richard Farnsworth, Sissy Spacek and Harry Dean Stanton. Other open night films included "My Best Friend," "Journey into the Sun," among others. The best film of the day may have been the last, at midnight "East of East" played in the Nugget Theatre and it was raved about by many of its viewers. Today, Saturday, the morning hype surrounded Telluride's tribute to Catherine Deneuve. Everyone who was fortunate enough to get in loved it. At noon we caught the Seminar at Elks Park where Catherine Deneuve was one of several guests which including actor/writer/director, ah you get the point, James Toback ("Bugsy," "Two Girls and a Guy," "The Pick-up Artists," "Black and White" among others) his work is truly hip and cool. I was in heaven! 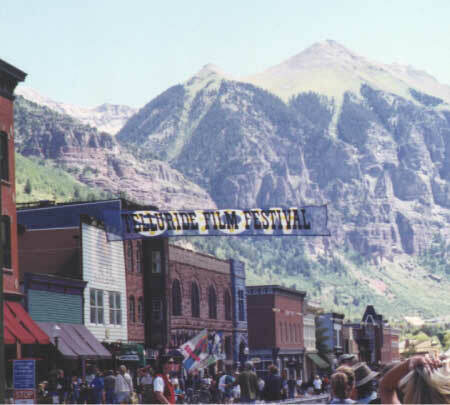 Telluride has a knack for honoring well respected and highly qualified actors, directors and writers. Catherine Deneuve is no exception. For me, her best work was in "If I Had To Do It All Over Again," (1976) directed and written by Cladue Lelouch. Though the story and screenplay were flimsy at best, the performances were excellent, in particular Catherine's depiction of a woman who had been in prison for 16 years. She has appeared in over 90 films...yes, 90. In 1957 she first appeared in "Collï¿½iennes, Les" as Catherine Dorlï¿½c. Five decades, and still going strong. She just finished filming the drama/musical "Dancer in the Dark," directed by Lars von Trier, due out next year... that will make six decades. I hope I can live at least six decades, let along keep the same job. Tonight we hope to catch "Black and White," directed by none other than James Toback. The film stars Scott Cann, Robert Downey Jr., and Stacy Edwards. The story centers around a group of white high school teens who become involved with Harlem's black hip-hop crowd. All in all, Telluride never disappoints. We're having a great time. Great films, great food, great parties, and best of all great scenery and great people!